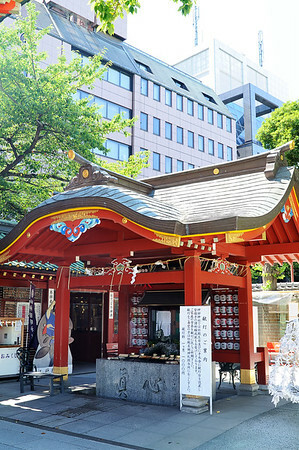 Kanda Shrine (神田明神 Kanda myoujin, formerly 神田神社 Kanda-jinja), is a Shinto shrine located in Chiyoda, Tokyo, Japan. 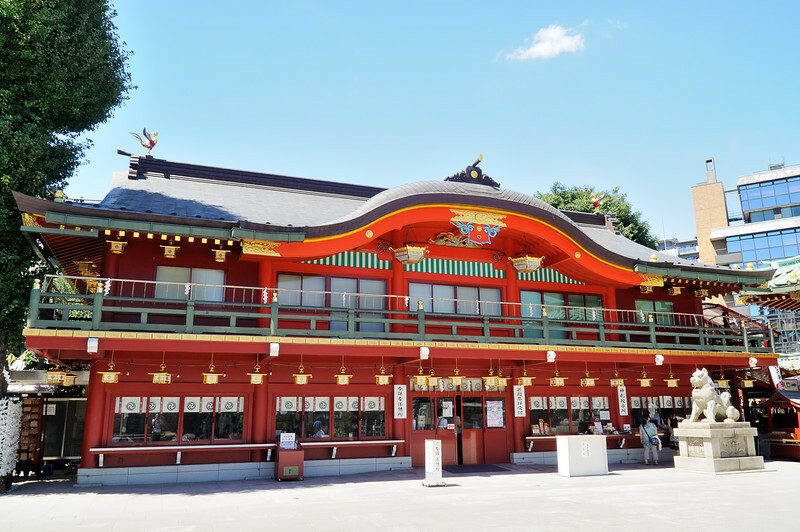 The shrine dates back 1,270 years, but the current structure was rebuilt several times due to fire and earthquakes. It is situated in one of the most expensive estate areas of Tokyo. 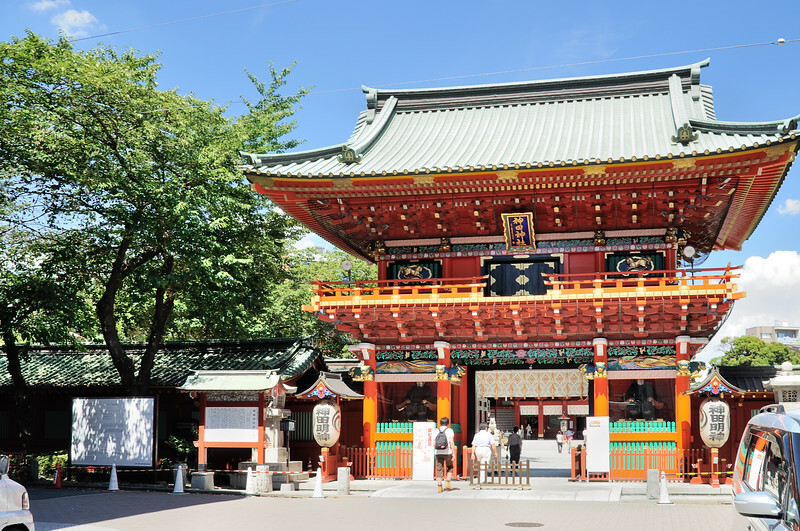 Kanda Shrine was an important shrine to both the warrior class and citizens of Japan, especially during the Edo period, when shogun Tokugawa Ieyasu paid his respects at Kanda Shrine. What I would like to add, it's huge. In fact, it's big enough to need a map (provided below). 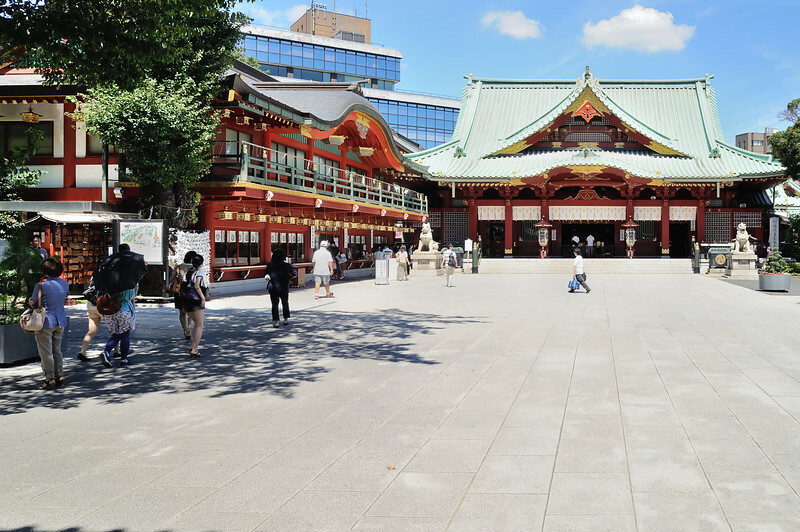 For a shrine that is located in so crapmed city as Tokyo is, the size of the shrine is astounding. It is even more if you consider than many places were dimnished or demolished in orderd to make more space for new buildings (more about that later). Ok, despite it's sort of fancy and outdated kanji, it's just an entrance gate. Or is it? According to shrine's official website (link at the bottom), this gate was built to commemorate 50 year of rule of the Hirohito Emperor. The entire structure is made out of hinoki cypress (Japanese cypress). 隨 means 'to abide (by the rules)', to follow (rules). 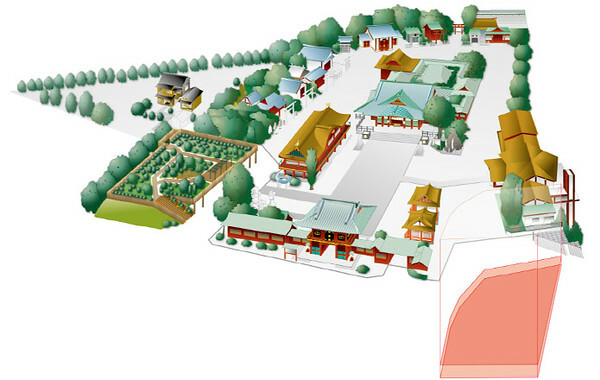 Majority of the structures is around this square, but there are some behind the shrine as well. Obviously I did't look at the map and so, I didn't see it. 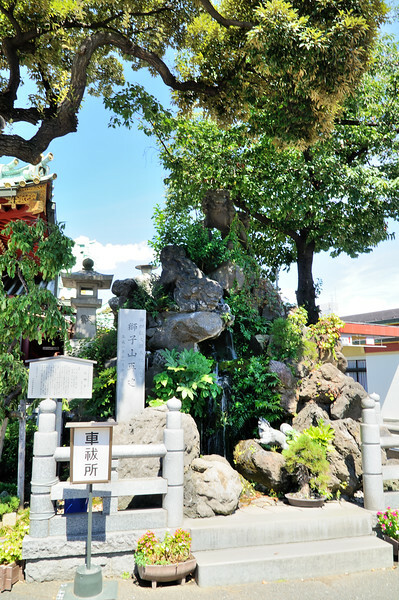 Shrine itself. Look at the girl in white and red outfit. It is Shinto Priestess and her uniform colours make it an easy way to recognise whether you are at the Shinto Shrine or Buddhist Temple. 鳳凰殿 means the Palace of the Phoenix, but not just a normal phoenix mind you. It is the Chinese phoenix, a.k.a Fenghuang (which to me, looks more like a peacok than a phoenix, but well, anyway...). 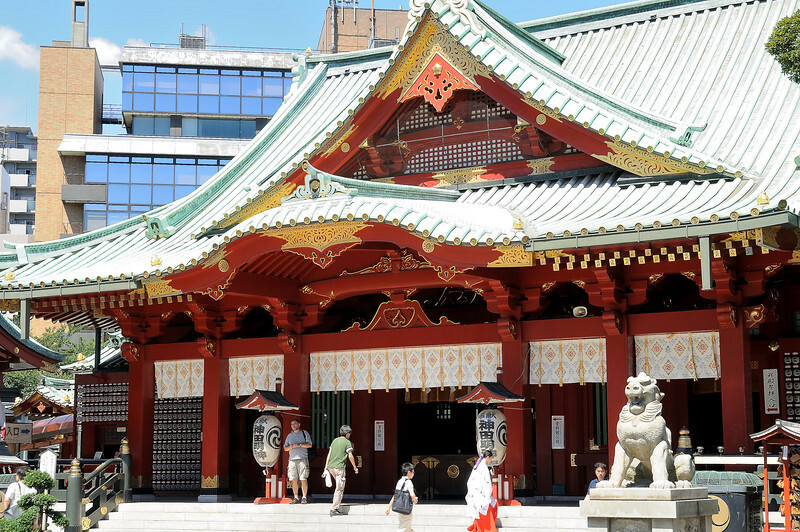 It has three flors and according to the shrine's website, on the ground floor you can buy talismans, amulets. The second floor is where priests engage in religious rituals. The thrid is a storage room for festival costumes and decorations. Honestly, I am not quite sure what the bigger building is. 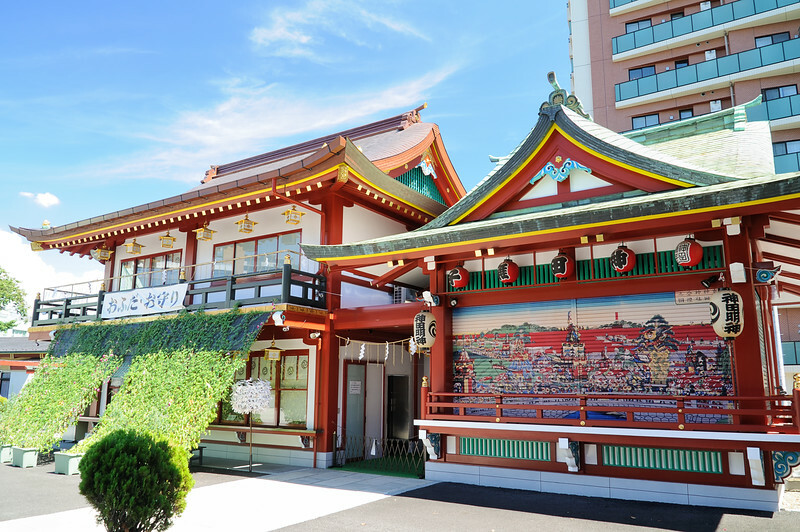 The smaller one is called Kagura Hall (神楽殿) and my assumption is that during festival days you can see Kagura - Shinto theatrical dance on the small stage at the front. Considerng that the big bulding has 祭 'matsuri' (festival) letter in its name, it may be a building where the items needed for Kagura are being kept. However, if I'm wrong, let me know in the comments. 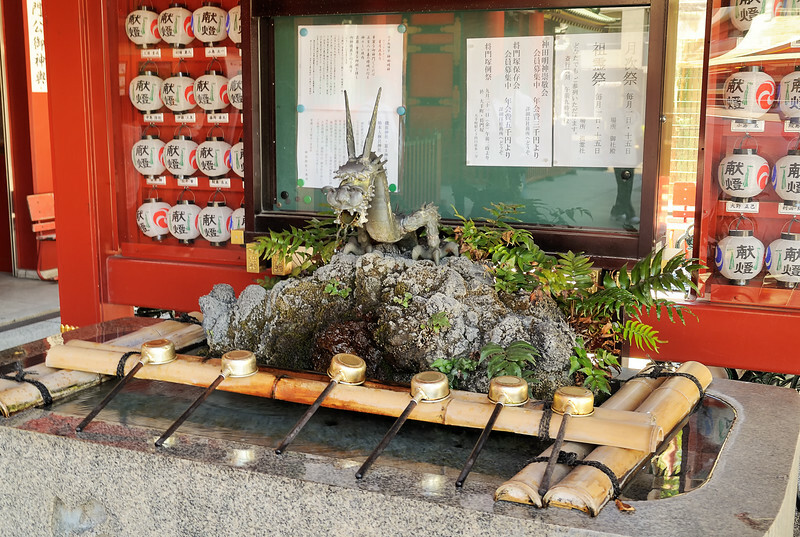 手水舎 'chōzuya' or 'temizuya' - is a Shinto water ablution pavilion for a ceremonial purification rite known as temizu. (yaay, wikipedia for the win. I don't have to be creative while writing description here). 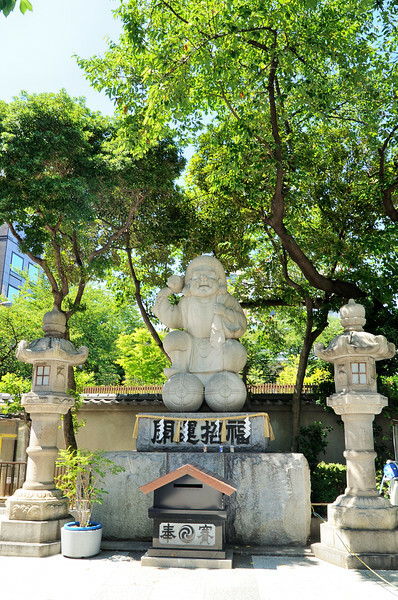 だいこく様尊像 - Statue of Daikoku. No idea what it is (read as: nothing about it on the wikipedia). Definetly a POI, place you should visit. It's huge, looks really nice and is close to Akihabara, place where every turist goes hoping to see dirty anime or maid cafeteria. Just do not repeat my mistake and do not go there in the summer. In Japan temperature easily hits 38 degrees, and in Tokyo it's probably over 40 (buildings, no wind). http://en.wikipedia.org/wiki/Kanda_Shrine Wiki page about shrine. http://en.wikipedia.org/wiki/Ch%C5%8Dzuya Wiki page about temizuya. http://www.kandamyoujin.or.jp/ Official Website. Has got lot of information, but it is all in Japanese.